In volleyball, senior setter Sydney Miles is directing a potent offensive attack that ranks second nationally in hitting percentage. Elise Viox, one of three seniors on the women's cross country squad, clocked a personal-best 6K time of 22:32 at the Furman Classic, placing fourth out of 206 runners. 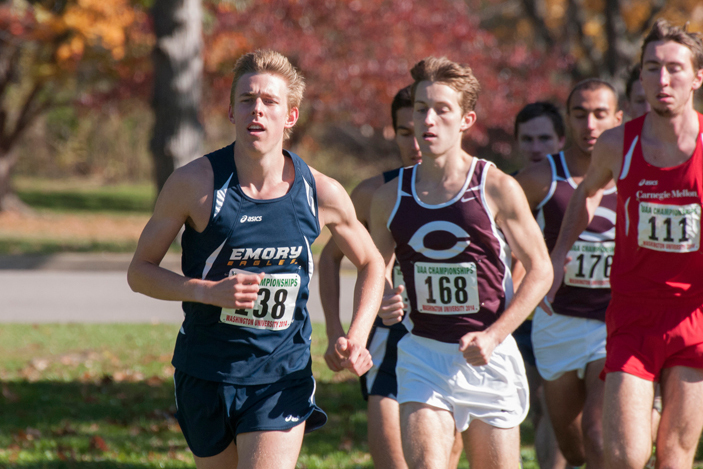 Senior Lukas Mees has ranked as the men's cross country team's No. 1 runner in both September meets. 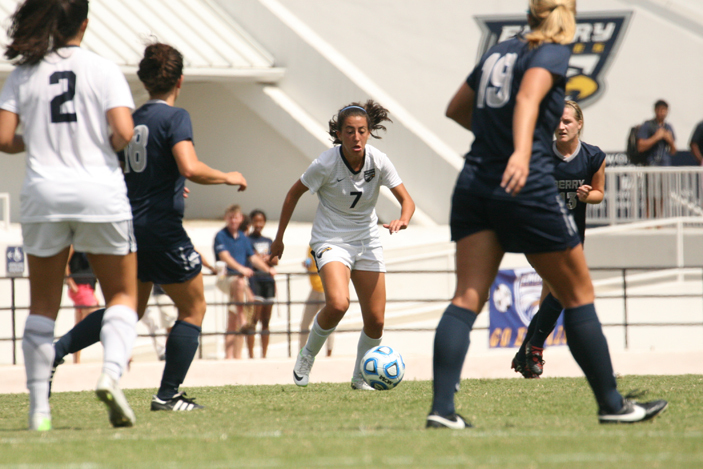 Junior Cristina Ramirez scored four goals in September, leading offense for Emory women's soccer. 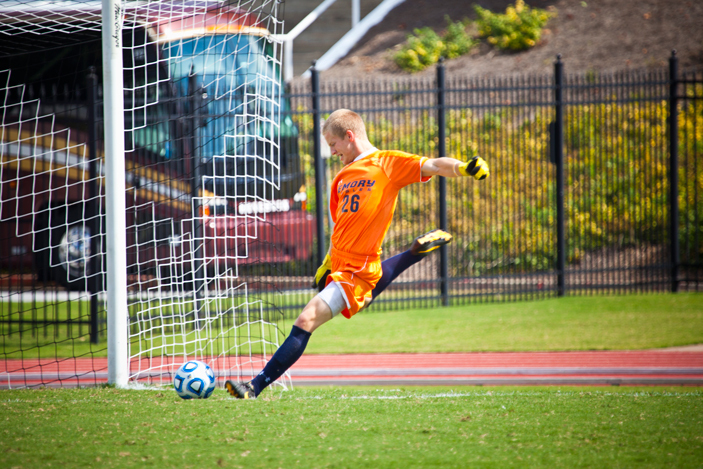 In September, senior goalkeeper Abe Hannigan tied the school record with 21 career shutouts for the Men's Soccer team. The fall sports season is in full swing with Emory athletic teams racking up winning records in the first weeks of competition. Here are highlights of how Eagle squads fared in September, with details of when you can cheer them on this month. Emory athletic events are free and open to students, faculty, staff and the community to attend. Unless otherwise noted, competitions are held at the Woodruff P.E. Center. The volleyball team continues to maintain its status as one of the premier programs in the NCAA Division III ranks, posting a 15-2 record to go along with a No. 3 national ranking. One of the early season highlights for head coach Jenny McDowell and her squad was an impressive 3-1 victory at No. 1-ranked Calvin College during the opening weekend of the year. The Eagles have played one of the most competitive schedules nationally and have already claimed four triumphs over programs ranked in the top 20. 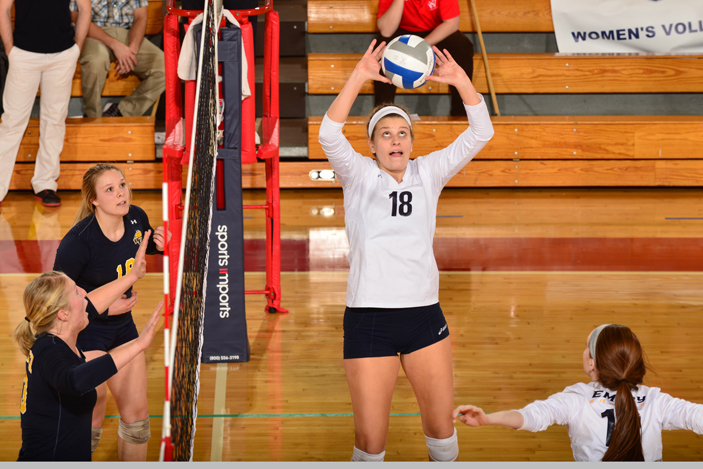 Senior setter Sydney Miles is directing a potent offensive attack that ranks second nationally in hitting percentage, doling out 11.59 assists per set, with that mark ranking second among all D-III players. Junior Kathryn Trinka has been one of the team's primary attack threats, pounding out 3.72 kills per set, good for the No. 2 spot among University Athletic Association players. Oct. 13 vs. Lee University, 6 p.m.
Oct. 30 vs. Bridgewater, 4 p.m.
Oct. 30 vs. Juniata, 6 p.m.
Oct. 31 vs. Millsaps, 10 a.m.
Oct. 31 vs. Clarkson, 12 p.m. The women's cross country team closed out the month of September ranked No. 1 in the South/Southeast Region and 31st in Division III. Boasting one of the program's deepest and most competitive rosters in recent memory, head coach John Curtin saw his squad open the year with an impressive first-place finish out of 22 teams at the Furman Classic. 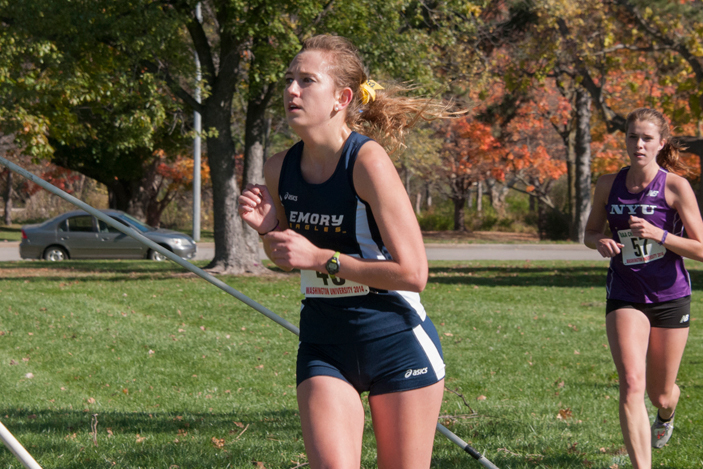 Emory followed that with a fourth-place effort in a 10-team field at the Charlotte Invitational, with the three teams ahead of Emory all NCAA Division I programs. Elise Viox, one of three seniors on the squad, paced the Eagles' pack in each of the first two competitions and clocked a personal-best 6K time of 22:32 at the Furman Classic that slotted her fourth out of 206 runners. Sophomore Gabrielle Stravach was the No. 2 Emory finisher at the Furman and Charlotte events, registering a personal-best mark at Furman. The men's cross country team is off to a solid start to its 2015 campaign, earning a No. 1 ranking in the South/Southeast Region and a No. 32 spot in the national poll. After posting a third-place finish out of 19 teams at the Furman Classic, the Eagles held their own at the Charlotte Invitational, which featured a number of Division I programs, racing to runner-up status out of 11 teams. Senior Lukas Mees has ranked as the squad's No. 1 runner in both meets, coming through with back-to-back personal-best 8K times that has helped him earn UAA Runner of the Week honors twice. Junior Michael Sisario has scored in both competitions while the return of a healthy Grant Murphy will bolster the team's fortunes. Playing its first five games on the road and starting out 1-2, a young and talented women's soccer team righted the ship and rattled off a six-game winning streak that helped the Eagles close out September with a 7-3 won-lost ledger. Head coach Sue Patberg and her charges are looking to gain a sixth-consecutive trip to the NCAA Tournament, with a 28-member roster that is comprised of 21 freshmen and sophomores. While the younger members of the squad acclimate to the college game, junior Cristina Ramirez and sophomore Kaitlyn Dorka have provided some offensive punch with four and three goals, respectively. Defensively, junior defender Hannah Meyer headlines a strong back line that has surrendered just an average of 4.7 shots per game. In goal, senior Liz Arnold has been another obstacle for opponents, allowing just 0.88 goals per game while posting three shutouts. Oct. 10 vs. Washington University, 11 a.m.
Oct. 22 vs. Centre College, 7 p.m.
Oct. 30 vs. Brandeis, 5 p.m. The Emory men's soccer team regrouped strongly after an early-season three-game losing streak, and closed out the month with four straight wins, leaving its record at 5-3-1. September saw some personal milestones reached with head coach Sonny Travis pocketing his 400th career victory following a 1-0 decision over Sewanee (Sept. 23), while senior goalkeeper Abe Hannigan tied the school record with 21 career shutouts after he and his teammates blanked Millsaps by a 2-0 count. Senior Sebastian Hardington ranks as the team's leading scorer heading into University Athletic Association play with eight points on the strength of four goals. Sophomore Christian Meyer was close behind with three goals accounting for his six points. Oct. 10 vs. Washington University, 1:30 p.m.
Oct. 21 vs. Birmingham Southern, 7 p.m.
Oct. 30 vs. Brandeis, 7:30 p.m.